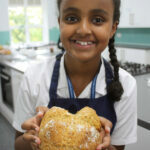 The Senior School co-curricular and enrichment programmes have got off to a busy – and tasty – start. 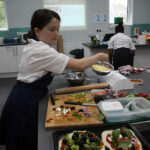 Years 7, 8 and 12 have been enthusiastically sampling the fruits of their labours in the Aspire and Stretch programmes, which are designed to broaden their experience base and build on their skills sets. 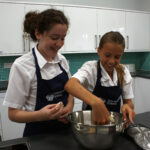 Year 7 got started on a ‘knead to know’ basis, learning to make wonderful soda bread loaves in the school’s state-of-the-art cookery suite, as well as apple crumble.. Year 8 followed suit by serving up apple turnovers and creating scrumptious homemade pizza, piling their bases with lots of great toppings. 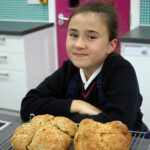 The results were so tasty that, unfortunately for parents, very few of their products made it home! 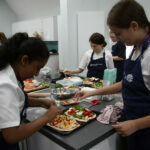 Meanwhile year 12 turned their hand to creating homemade pasta and pesto. Creativity and problem solving were on the agenda for members of this year’s Robotics club for years 7-9 which is back stronger than ever after taking second place at the VEX Robotics competition at South Hampstead High School last term. 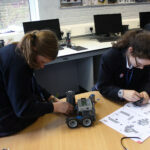 Club members are being tasked with building a robot from a kit and adding their own twist. 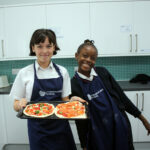 They will then programme it, practice operating it and finally take it to a competition against other GDST schools later in the year. 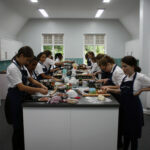 There are also many competitive inter-house and GDST inter-school events which add another interesting layer of opportunity and engagement in the wider life of the school.